This guide is going to shed light on a popular power tool, the Paslode cordless 16 gauge stapler. You’ll get to read all of its features in one place together with specifications regarding this product. This is a staple gun designed for professional use. Such a model handles large projects that require extended use while providing maximum comfort and the flexibility to adapt to different situations. The portability of this stapler means that you can quickly move around from project to project. It also makes your environment less cluttered and safer since you’re removing cords that you can accidentally trip on. First of all, this particular model is lightweight compared to many other staplers. As a result, it reduces fatigue that tends to set in after a long period of use. This also means that your productivity will increase, allowing you to finish jobs faster. But that’s not all. Efficiency is integrated into the design itself. Therefore, the quick-clear feature reduces downtime and helps you move on to the next staple. As for the handlebar, it is ergonomic for a comfortable grip. Moreover, there’s an extra metal bar at the side to help you stay aligned. The Paslode cordless 16 gauge stapler is powered by a fuel cell. You can purchase the brand’s fuel cell separately to fit this specific model. While the fact that the battery runs down may be a concerning aspect of the portable staple gun, you can purchase two or more fuel cells and simply replace them as the charge runs out. The fuel cells can also be charged for repeated uses. Therefore, this choice might be more economical than you think. Here are some of the specs you should be aware of if you’re thinking about purchasing the Paslode electric stapler. The price is on the high side. You have to remember that the stapler is designed for professional use. In other words, the design will deliver optimal performance with each project. It’s also important to factor in the cost of the fuel cells into the price. This is an electric stapler. As mentioned earlier, you can purchase the fuel cell that is sold by Paslode. These cells are rechargeable. The stapler itself does not come with a fuel cell. You can use a staple range of 3/4 to 2 inches. This is a respectable range and makes this one of the more versatile staplers in the market. The magazine capacity is around 150. The stapler can shoot around two to three staples per second. The fuel cell designed for this stapler can handle around 2,400 nails per charge. The weight of this model is 6.3 lbs, reducing fatigue and allowing for extended use. While the Paslode stapler received mostly positive reviews from customers, it’s better to list the product’s pros and cons regardless. This way, it’s easier to assess whether or not it’s right for you. – Some customers would have liked it better if this model used lithium-ion batteries instead of the fuel cells. This would allow them to interchange batteries with other Paslode tools. – It was reported that the fuel cells had trouble delivering power in cold weather. They needed to be heated in order to get the stapler running again. – There were a few orders with missing parts. However, such a fault concerns the retailer rather than the manufacturer. It’s important to mention there were only several complaints about the Paslode stapler. Most customers were very happy with the purchase. They mentioned how the stapler never had a jamming problem, got the job done very quickly, was comfortable to use, and reliable. Overall, the Paslode cordless 16 gauge stapler has received an overwhelming number of strong reviews from customers. 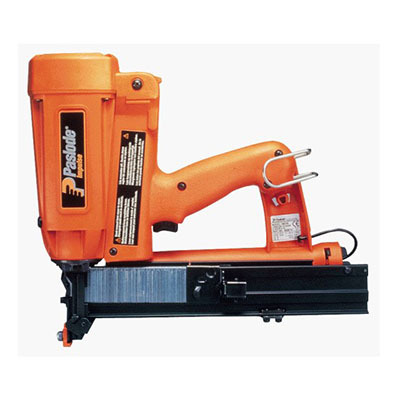 Usually, staple guns have a good mix of positive and negative reviews. But the Paslode stapler has been given almost nothing but praise about the various features and benefits of the design. If you have any thoughts on this model or want to mention other related products that you think we should look into, let us know by leaving your comments below.